Control breathing have been used as an effective strategy to calm down during stressful situations in daily life during centuries. The usual advice to “take a deep breath” under emotion circumstances such as stress, anxiety and anger is a clear indication of this, yet we do not normally stop to consider the connection between our breathing and emotional states. There is a study realized in Japan where two hundred and forty-one male and female undergraduates completed the questionnaire concerning stressful events in the real life and relaxation strategies they used to overcome these stressful events. The result clearly showed that the most numerous relaxation strategy was deep breathing. About 60% of subjects reported that they control breathing to calm down in their stressful situation. Many subjects have answered this question telling that abdominal breathing technique (diaphragmatic) was an effective strategy to calm down (1). Relaxation through slower breaths ( fewer than 10 cycles per minute) , used in relaxation techniques like yoga and meditation, have been thought for a long time to have positive effects in the reduction of blood pressure. Basic studies which support these empirical and clinical observations and looking to clarify the relationship between relaxation and respiratory functions, were started in the 1970s. A paper published in 1996 in Psychosomatic Medicine have referenced many of these basic studies in discussing about the therapeutic usages of the slowed respiration maneuver in attenuating the cardiac autonomic responses in patients with anxiety disorder (2). However, despite the many clinical observations suggesting this direction, the medical science in general, particularly in cardiology, have overlooked about the influence of breathing and its relationship with the autonomic nervous system and the heart in weighing cardiac risk factors. Fortunately, recent studies are shedding more light and evidences to the subject giving new grounds for the scientific establishment regarding the link breathing/emotional states. Their findings show that sympathetic activation and parasympathetic withdrawal is implicated in the pathogenesis of hypertension, obstructive sleep apnea, and congestive heart failure and that respiration contributes importantly to the decrease of sympathetic hyperactivity and the improvement of baroreflex sensitivity (3 - 13). Also interesting is that while some studies have documented greater total muscle sympathetic nerve activity (MSNA) during hypercapnia compared with hypoxia, other studies observed a higher MSNA response to hypoxia compared with hypercapnia in participants with slow and fast spontaneous breathing rates. Whereas the authors were unable to distinguish between chemo reflex, respiratory or cardiovascular induced activation their data suggest that hypercapnia and hypoxia cause distinct patterns of activation within regions normally associated with sympathetic control (15, 16). Taking in view that continuous positive airway pressure treatment may reverse early signs of atherosclerosis (17) we think the slow breathing practice may also contribute for the prevention or regression of atherosclerosis, by reducing the sympathetic hyperactivity, be it stimulated by hypercapnia, hypoxia or other factors, according to the acidity theory concept (18, 19). 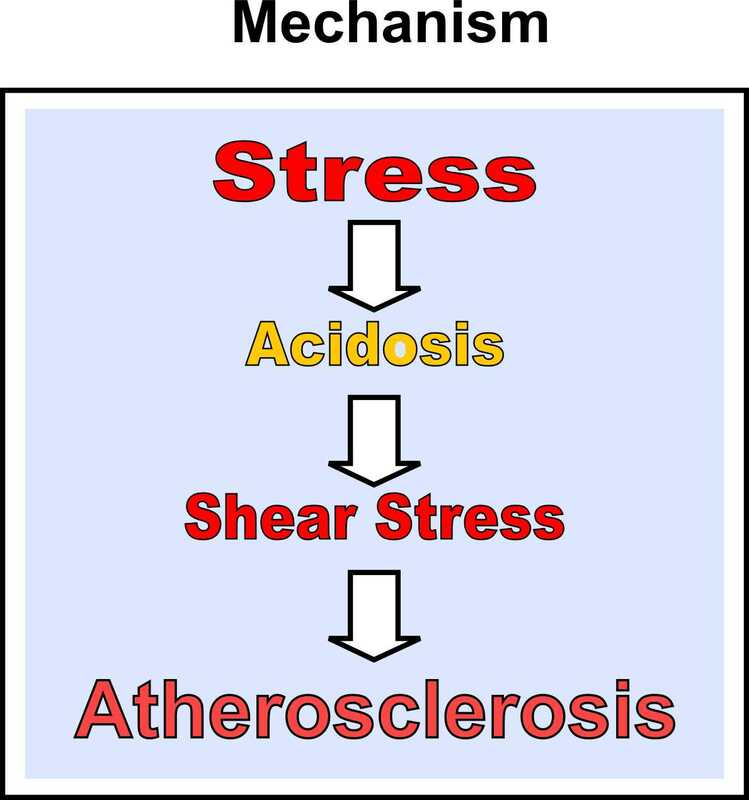 Moreover, hypertension is an important risk factor for the development of atherosclerosis, with these processes sharing some common mechanisms. The endothelium is usually placed as a probable central focus for the effects in both diseases, with evidences leading to the postulation that hypertension predispose and accelerate atherosclerosis (20). Transcendental Meditation not only lowers colesterol (21) and blood pressure (22, 23) but also reduce atherosclerosis (18). Most interesting is that a meta-analysis of 31 studies found that TM produces a lowering of plasma lactate (24, 25). Lower plasma lactate indicates profound relaxation, since high concentrations of lactate have been associated with stress situations (for example high anxiety), and high blood pressure (20). More data about lactate, stress, hypertension and reduction of atherosclerosis on patients submitted to Ioga or TM at the acidity theory of atherosclerosis article (18). 3. Clark ME, Hirschman R., Effects of paced respiration on anxiety reduction in a clinical population, Biofeedback Self Regul. 1990 Sep;15(3):273-84. 5. Grossman E, Grossman A, et al. Breathing-control lowers blood pressure, Hum Hypertens. 2001 Apr;15(4):263-9. 6. Viskoper R, Shapira I et al. Nonpharmacologic treatment of resistant hypertensives by device-guided slow breathing exercises. Am J Hypertens. 2003 Jun;16(6):484-7. 7. Schein MH, Gavish B, et al. Treating hypertension with a device that slows and regularises breathing: a randomised, double-blind controlled study, J Hum Hypertens. 2001 Apr;15(4):271-8. 8. Elliot WJ, Izzo JL Jr, et al. Graded blood pressure reduction in hypertensive outpatients associated with use of a device to assist with slow breathing. J Clin Hypertens (Greenwich). 2004 Oct;6(10):553-9; quiz 560-1. 17. Drager LF, Bortolotto LA, Figueiredo AC, Krieger EM, Lorenzi-Filho G. Effects of continuous positive airway pressure on early signs of atherosclerosis in obstructive sleep apnea. Am J Respir Crit Care Med 2007; 176: 706–712.